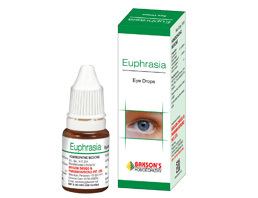 Product Description: Bakson's - Homeopathy - Euphrasia Eye Drops Discomfort of Dry Eyes. Congestion of Eye. Conjunctivitis is an inflammation of the conjunctiva most commonly due to an allergic reaction or an infection and presents as redness (Hyperaemia), swelling of conjunctiva (Chemosis) and watering (Epiphora) of the eyes . Keratoconjunctivitis sicca is caused by decreased tear production or increased tear film evaporation. It presents as dryness, burning & a sandy-gritty eye irritation that gets worse as the day goes on. Blepharitis is an ocular disease characterized by inflammation of the eyelid margins and presents as redness of the eyes, itching and irritation of the eyelids. All these eye affections are effectively relieved by well known homoeopathic medicine Euphrasia Indications of Euphrasia Eye Drops : Helps relieve symptoms of conjunctivitis especially congestion of eyes, excessive watering, irritation and photophobia besides discomfort of dry eyes Dosage of Bakson's Euphrasia Eye Drops : Instil 1 or 2 drops into the eye, 3 or 6 times daily.